Dave Keena, the author's father-in-law, attended Camp Hayo-Went-Ha on Torch Lake, Michigan as a camper and counselor from 1934 to 1942. This partly fictional memoir follows him as he grows from a boy to a young man and leader during those nine summers. The reader shares Dave's adventures from his first train ride to camp in 1934 to the last day in August 1942 when he shook hands with his best friend as they parted company in Detroit, heading their separate ways to war. In between, Dave learns that the hardest times can be the best times, that friendship and leadership demand we put others ahead of ourselves, and how sweet a kiss can be at a midnight rendezvous. 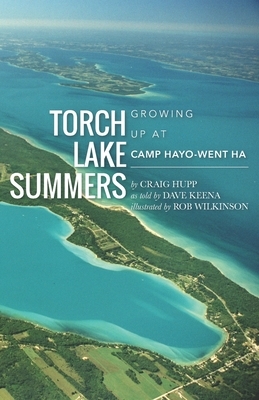 The book has photos of camp from the 1930s and over a dozen illustrations by camp alumni Rob Wilkinson.Torch Lake Summers has received enthusiastic reviews.John U. Bacon, a camp alum and best-selling author -- "Torch Lake Summers is a sweet story, full of humor, heart and soul. "Dave Martin, Camp Director, Hayo-Went-Ha -- "Craig is a master storyteller. A great friend of camp, he has faithfully brought camp in the 1930s to life. "Grace Ott, retired camp nurse -- "Dave's diary-like reminiscences of camp life, the schedule and activities will awaken many a fond memory. His stories about Cap Drury's hearty leadership, discrete discipline, phenomenal memory, and vision for camp are priceless.